Ronan Bennett’s HAVOC, IN ITS THIRD YEAR is set in the north of England in the 1630s. It is the story of John Brigge, a respectable county civil servant who is also a covert follower of the “old religion”. Brigge is the parish coroner, and the book begins with his investigation into a local woman who appears to have murdered her baby. There may be more to the story than meets the eye or it could be that Brigge’s compassion towards the desperate wretches that appear before him day-in and day-out has clouded his judgement. In either case, Brigge raises suspicions among some of the local townsfolk and his life, complicated already by his own wife’s pregnancy, takes a dramatic turn for the worse. Bennett skilfully portrays a man on the edge and a country at the cusp of a disastrous civil war; among many remarkable passages he gives us Brigge’s dreams that mix murderers, wives, victims, secret priests and unborn children in a swirling whirlpool of guilt and fear. Brigge is ultimately betrayed as a Catholic by a jealous clerk and he and his family go on the run through a nightmare landscape no less vivid than the dreamscape. Ronan Bennett and I were born only a few miles and a few years apart but we’re from different cultural and political universes. Bennett was radicalised in the early seventies and apparently he has lost none of his righteous indignation. He has got himself into passionate debates with Martin Amis and Christopher Hitchens and he has said unfortunate things about the Omagh bombing - things which he has since recanted. 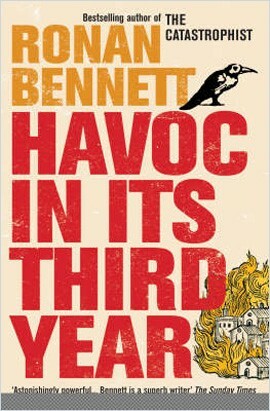 But surely no one can fault Bennett’s fury at our contemporary scene, and his prose tells us something about the writer behind the disputes: clinical, dispassionate, ironic, intelligent, careful and ultimately incendiary. His plots move, his writing pulses, and his characters live and breathe and disagree with each other and often him. He takes his time with his protagonists, allowing them psychological and spiritual depth and yet he understands that characters alone aren’t enough; for a book to succeed it must have a strong, well planned narrative. Bennett’s novels are structurally sound and that hardest of combinations: unpredictable, yet completely convincing.